The group awoke to the gentle knocking of Rihari, our Māori guide, upon the inner wall of the carved house’s facade. As the eyelids peeled open, the sounding of sleeping bag zippers bounced off the walls where framed photographs of ancestors oversaw our slumber. As is customary within the Marae, Rihari lead us in prayer spoken in his native tongue of Te Reo. Though I could not understand the spoken words, I felt the weight of its meaning like gravity turned upside down within me. The energy brought me briskly to my feet, and I exited the house to bask in the glow of the new rising sun. One of my main priorities of engagement for this program is to interact as often as possible with our Māori hosts, and I was pleased to be met with openness and enthusiasm by Rihari as we discussed matters of farmland conservation, youth engagement, and his 25 year career serving in the military alongside US troops in Vietnam and elsewhere. We spoke for close to twenty minutes, before he ushered us in for our communal breakfast. Now, these meals are not simply people running through city streets with paper cups and egg mcmuffins as Americans have normalized within the rat race of capitalism; the vibe was that of ceremony and community. Our hosts included the Queen of the tribe, and they had been preparing for what I can only assume as long as an entire UW class period to fill our bellies with subsistence and WONDERFUL taste. And can you guess who was first to Eat? Of course, us. The guests are expected to serve themselves first from a 30 foot table brimming with something for everyone until their wrists give way beneath the weight upon the plates. After we’ve seated, the Queen, Rihari, and others members of the tribe follow, organizing their plates with humble portions. I greatly value these meals. It is in those times when I bond with my UW classmates. Three days ago we were nearly strangers. Today, I could tell of their own tribal affiliations, genealogical makeup, and top five favorite movies of all-time. Following the meal, Rihari lead us once again in prayer, where we responded with a Māori song we have committed to memory in the interest of cultural immersion. After packing up our gear and putting away the bedding provided to us, I once again had the privilege of sharing conversation with a Māori host – this time with Haami who is the chairman of the tribe consisting of 30,000+ members. All I had to do was ask him to tell a bit of his life’s story, and his response was a thoughtful oral history of where he began, where he’s been, and where he currently finds himself. I am choosing to keep that gift for myself. Following a visit to their art center, Te Whare Whiri Toi, and a dizzying bus ride through the Northland countryside, we found ourselves atop what is considered to be the most spiritually significant place for Māori. This place is Te Rerenga Wairua, or Cape Reinga. This northernmost point of the island is where Māori peoples spirits leave the material world to descend into the underworld (reinga) by sliding down a root into the sea below. The spirits then travel underwater to the Three Kings Islands where they climb out onto Ohaua, the highest point of the islands and bid their last farewell before returning to the land of their ancestors, Hawaiiki-A-Nui. Haami shared an anecdote where those who came to say their final farewells to the deceased had observed footprints in the sand where the dead walk. The path that they travel is distinct, even mapped out precisely by chief orators. Te Rerenga Wairua (Cape Reinga) is the beginning of the spirit’s pathway, leading to the ancestral home of Hawaiki. Through an ecological lens, this landscape fascinates me. The soil, formed from underlying serpentine rock, has toxic levels of saline elements. It lacks others like calcium and phosphorus, which help plants grow. So the Cape is a strange heartland of dwarf plants, many found only there. This is also a meeting point for the Tasman Sea (to the west) and the Pacific Ocean. The result of their meeting is a unique swirling of currents, or the creation of life, between the male sea Te Moana Tāpokopoko a Tāwhaki and the female sea Te Tai of Whitirela – the beginning of it all. The rest of the day was spent connecting with more amazing folks. Professor Chris Teuton and I spoke of our backgrounds, interests, literature, and how to improve memorizing ability with the “memory palace”. Dani, Racquel, Nathan, and I discussed racial and gender injustices. A group of us played a game. Some of us took advantage of the trampoline overlooking the bay, imagining what it is to fly. I hadn’t finally laid down to rest until 1:30am after extensive talks with Eunice, Dani, David, and Matt about our lives, dreams, and how or heritage influences our world views. And here I sit in our rental house, listening to the laughter of blooming friendship, the howling of the wind, and a very full dishwashing machine. 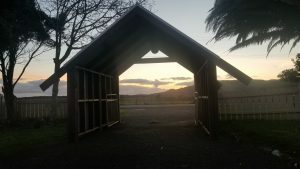 This entry was posted in Our Experiences and tagged Aotearoa, Cape Reinga, Maori, New Zealand, Study Abroad, University of Auckland, University of Washington on August 26, 2017 by Steve Guardi.